The Newton Free Library applied for and got a cool LSTA ( Federal Library Services and Technology Act) Grant to do a bunch of STEM related programs, and I have the honor of doing a bunch of coding and robotics workshops there over the next few months. They got a bunch of cool new equipment to run these programs including Finch Robots, Arduinos (Sparkfun Inventors Kits), a KIBO robot, and … wait for it… a bunch of Littlebits sets. NFL Assitant Director Jill Grabowski was kind enough to lend me the coolest littlebits set: The Korg Synth kit. AT LITTLEBITS, WE ARE ON A MISSION TO DEMOCRATIZE HARDWARE BY EMPOWERING EVERYONE TO CREATE INVENTIONS, LARGE AND SMALL, WITH OUR PLATFORM OF EASY-TO-USE ELECTRONIC BUILDING BLOCKS. Unfortunately the thing that makes Littlebits easy is also it’s greatest weakness: The magnetic connection system. Especially when making something you have to manipulate (like a musical instrument), they tend to come apart, you lose power, etc. Now some of the other (more expensive) sets come with mounting plates (that you can also buy separately. I didn’t have one though, but I do have a laser cutter and a 3D printer. How hard could it be? Well, the devil is in the details. First I looked to see if it was already done. Thingiverse (I know boo….) has a few designs, including some by littlebits themselves, mostly specific component mounts. Rex Brodie posted this cool clip that fastens adjacent modules together. It works pretty well (very solid) but it was difficult to put the two bits in without pulling and pushing and putting a bit of strain on the boards. (Especially scary when the ‘bits are on loan). I tried just measuring and cutting holes with my laser, or a simple model with Open SCAD but I just couldn’t get the spacing quite right. which I printed and actually worked quite well. Only problem was, it was an STL (Surface Tessellation Layer) file, and thus not easily modifiable. I wanted wider, arbitrary shapes, etc! I could however pull Kris’s design into OpenSCAD, and do a trick to measure the “holes” and spacing. cuts off the bottom so the holes will show and projects the outline in 2D. I then exported this as a DXF file, and used inkscape to make measurements. The percentage bit is important (I calculated it, 6.63/6) if you are designing in inkscape because that is how you do a grid of evenly spaced objects. The 3D printed version came out pretty well, but the holes were a bit too small, so I enlarged them by .2mm (.1mm on the radius). and it worked perfectly! Now we can make mounting boards in any shape! While it’s true that I love geeky new toys, I’m not typically an early adopter, preferring to wait until the bugs are worked out. Several of my neighbors got the first generation 3Doodler, and since it first came out, there have been many imitators. 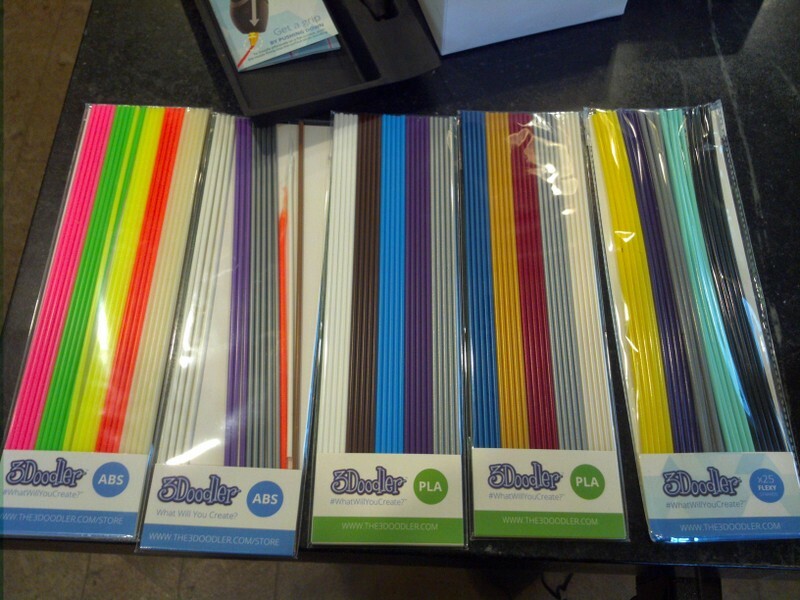 I backed the 3Doodler 2.0 kickstarter, and it arrived when I was away visiting family. It was a little annoying that it came via DHL with signature required. I managed to circumvent that via their website though, and it was nice to know ahead of time that I had a package coming. 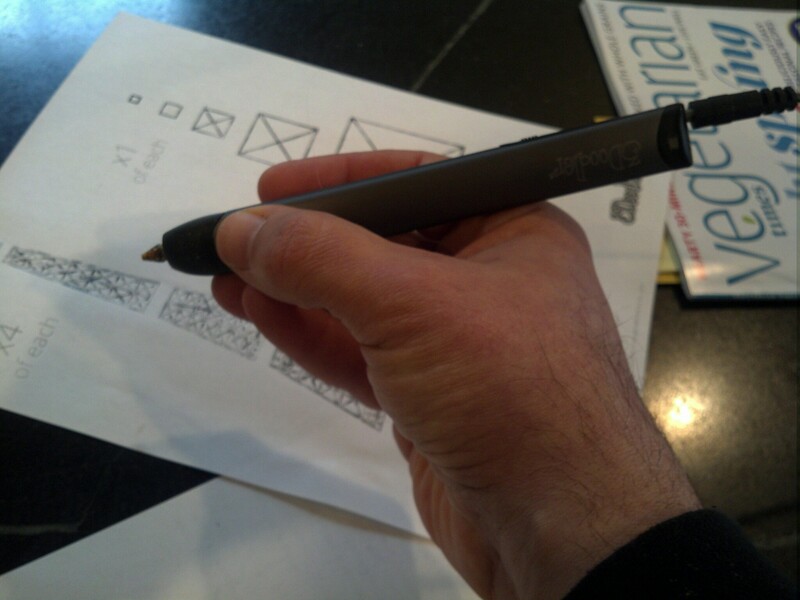 The new pen is Much Much sleeker and very pleasant to hold. I don’t have much experience with the first edition, but my impression was that it was clunky and it’s plastic case made me hesitate about spending $100 for an educational toy. The new design was a good part of what pushed me over the edge, and the metal case feels much more professional, and the mechanics seem to work really well. It comes with a little screwdriver to adjust the temperature, as well as a wrench to remove the nozzle and a cool spring thing to push through any unextruded plastic when changing colors. My 14 year old daughter initially almost threw it across the room in frustration. I think it was mainly a matter of expectations, as it does take a little while (after heating up) for a newly loaded strand to reach the nozzle. I also initially thought parchment paper (being heat resistant) would be good to doodle on, but it was a terrible choice as the plastic wouldn’t stick to it. We tried several other things, and eventually hit upon several good surfaces. It’s important not to doodle on a really cold surface (as our stone countertops are this time of the year in Boston) as the plastic shrinks quickly and comes unstuck. Some scrap acrylic worked really well, as did plain paper. Once we had things humming along, Charlotte tried again and instantly did the cute baby dragon in the photo above. While it’s not a fast process, its quite meditative. It comes with a nice variety of materials, 2 packs of PLA, 2 Packs of ABS and one pack of flexible filament. If you want to doodle in the air and make 3D objects in place, your only choice really is ABS as it hardens quickly. It would probably also benefit from a desk fan to speed up the process. You can do some vertical stuff with PLA by doodling upside down and let gravity hold things straight for you. Another option is to doodle 2 dimensional parts and then tack them together with the pen. 3Doodler has a number of fun templates on their website that you can print out, doodle over then peel off and tack together. 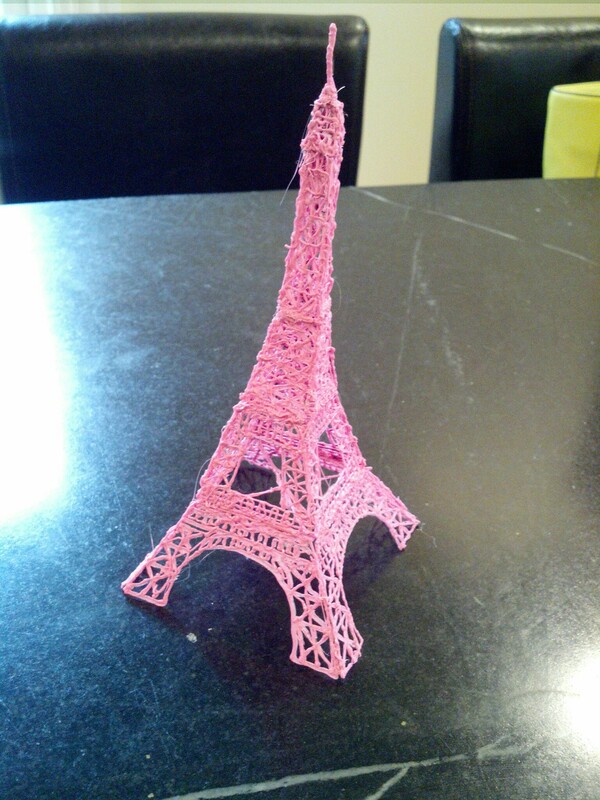 I did their classic Eiffel Tower. The first thing you’ll notice is that if you want precision, and a clean aesthetic, you should just get yourself a 3D printer. That said the drippy organic look has it’s own charm. The second thing you’ll notice is that I made it from Pink PLA, and there certainly wasn’t enough of one color in the packs to do the whole thing. I’m fortunate to have a 3D printer that uses the same diameter (3mm) filament, so I cut some lengths of PLA. Because filament comes on a spool, the radius of the segments turned out to be a problem, causing it to not feed well. Holding the curvey segments over the stove burner (probably not recommended, a hair dryer would be a better choice). and rolling them straight on the counter made quite usable sticks that fed perfectly. There are two tools which are handy (and not included). One is a pair of tweezers to safely remove plastic from the outside of the nozzle, and a pair of cutters to trim the melty part off the end of a filament you’ve backed out when changing colors. They recommend you trim the end when reusing filament, but I managed to get the original sticks to feed in fine with little melty blobs on the end, but YMMV. One other really cool thing they did for their kickstarter was to offer education packs that gave a good price with a generous helping of accessories for educational institutions. 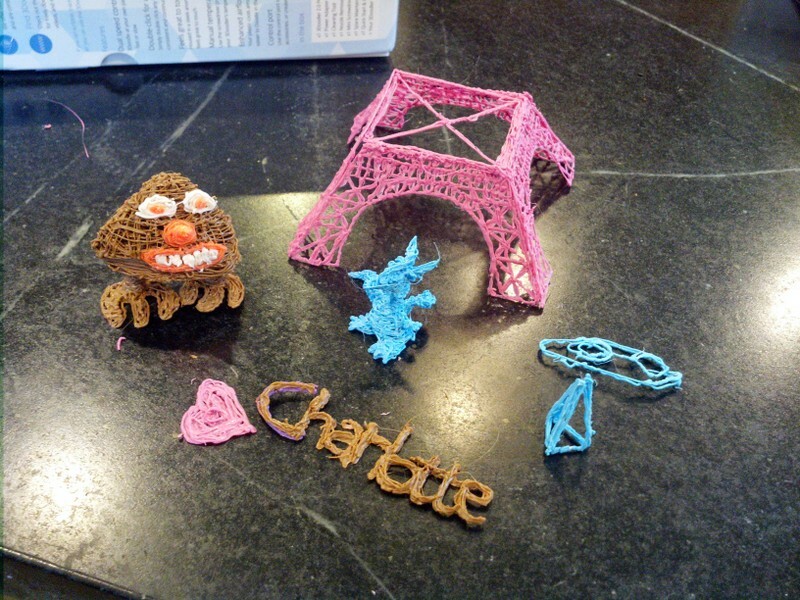 I think the 3Doodler 2.0 is a well engineered and fun gadget. I’m planning on getting together with my neighbors and we’ll compare with the first version, as well as get more kid reaction, but in general I think it’s a great creativity inspiring tool. The DangerousPrototypes Blog had a quick post on a deal that Texas Instruments was offering a Watch/development kit for their low power processors for only $24. I’ll be telling you more about this in a future installment, but while I was grabbing the deal, I saw this neat little development kit for their low-power value-line processors. It cost all of $4.30, includes two processors and all the tools you need to get going. First, while this is an extremely cheap USB enabled development board, this is NOT an Arduino. It is however, an excellent way to introduce yourself to real “on the metal” microcontroller programming. I downloaded all the tools, and visited their site for pointers to example code, etc. First, TI is really trying to do the community thing, with a wiki, and featuring other people’s content. They also have a really good, structured workshop with videos and labs to really give you an overview of the platform. So far, I’m about a third of the way through the workshop, and I’m really impressed so far. Installing Code Composer studio took a long time. It needs work on it’s installer code, as it gave all sorts of scary warnings about User Account Control in Windows 7, but in the end it worked out fine. free version limits you to 16 K of code, but that’s about the biggest device in the MSP430 value line. It’s also really nice having hardware debugging support. No more Serial printlns! Set breakpoints and examine variables. Awesome! These processors feature super low power features. In fact the other thing I bought, the chronos watch development platform uses the same line of processors. I won’t go into all the modes here (covered very well in the workshop) but these processors know how to sip power! We’re talking microwatts or less. The MSP430 processors feature an extremely flexible clock architecture. This allows you to do all sorts of clever things, using different clocks for different parts of the chip, or even driving external circuitry. I’m just starting to wrap my head around all this, but it’s one of the cool things my fpga friends brag about, and now I can play too! The Von Neuman memory map (single address space for everything) is much easier to use than the atmel’s harvard architecture. No more PROGMEM weirdness. Of course you still have to be ginger about writing to flash memory (constrained to write in blocks in self programming mode the same as AVR’s). It has pretty advanced analog to digital conversion with DMA, so you can set it up to transfer directly to memory. Not all the chips have this but many do, and some have fancy compariters to use for pid control, etc. All in all, I’m very impressed. I think it will be a lot of fun, and a good learning tool. It really isn’t as easy as the Arduino, so I wouldn’t recommend it for “Toe dippers” or folks looking for a quick and easy automation tool. If they keep offering it at this price though, it could be a great teaching tool. The processors (2!) it comes with are pretty small (both in IO and memory, 2K) so it will be hard to squeeze a lot of Arduino like library in there, but for some small teaching type challenges, it may be good enough, and you can always upgrade the processor for under $3. A week later, I also ordered the CapSense booster pack, a shield to demo the chip’s built in (no additional hardware needed) ability to handle Capacitive touch controls. I’ll probably post more about this once I’ve had the chance to play with it. I’ve had a lot of fun with my TV-B-Gone, which I bought direct from Mitch Altman (the inventor) at Maker-Faire RI a couple of years ago. I particularly like turning off the plague of flatscreens at work, and every one I can see through the glass doors in my building! I have a Nikon D90, and the little IR remote which has been very useful, but is pretty weak. It’s flakey past 5 feet, and you really have to point it right at the front of the camera. I thought, gosh, the TV-B-Gone is AWESOME, and open source, so I set about to make it into a super Nikon remote. Here’s the 1.2 kit from Adafruit. It’s more powerful because it uses a better design of cascading transistors. The 1.1 software was super easy to translate the timings to. I recently bought a version 1.2 kit (the current version) and ported the software which involved mostly changing the polarity of on/off, and using a single pin instead of two. The biggest part of this project was assembling all the bits to program. I built a usbtiny (Love it…) and used an extra TV-B-Gone pcb as a minimal target board. The thing is Awesome! I haven’t tested how far it goes, but it hasn’t failed me yet, and it bounces around any room I’ve tried it in to be far less directional. Thank you Mitch and Limor! Your code was great, and it was such a thrill to make something I wanted! You can download the firmware from github. Now the only problem is switching the chips. The 1.2 version frees up a pin to use as region select, so it is possible to use it as a switch to select between camera remote and tv-b-gone.